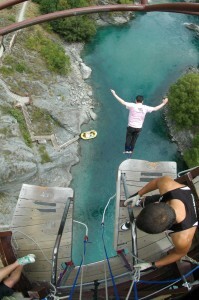 What does it feel like to do a bungee jump? I have a slightly different post for you today, one I have been meaning to write for months now. In February this year (2012), I flew to New Zealand to meet up with my friend Paul for a week in Queenstown on the South Island. One thing we decided to do was a bungee jump. It’s something I had always wanted to do, and it seemed like the perfect place to do it -after all, commercial bungee jumping started in Queenstown. I started doing some research on the internet about what it was like, but didn’t find anything detailed about the process, or the feelings, so I decided to write something and try to fill that gap. So this post will try to answer the question of what doing a bungee jump for the first time feels like. A lot of my experience was shaped by the extremely professional operation that A.J. Hackett runs in Queenstown as their whole operations is designed to manipulate you into successfully completing your jump. We signed up for our jump and paid in advance at a city centre location. This is important, because the photos do nothing to prepare you for how high up the actual jump feels when you’re standing on something looking down into space. Once you’ve paid your non-refundable fee, you have a significant stake in actually doing your jump. Our first reaction was ‘that is so high up, there is no way I am going to be able to jump off that bridge’. The check-in process is very quick though: go to the desk, sign in, get weighed, go to the toilet for one last time, then walk out onto the bridge. Luckily we didn’t have to wait at all. My number was first, so I was asked to sit down and they immediately started harnessing me up. First I put on a harness, then the bridge guys (jump masters?) wrapped a towel around and between my ankles, then they attached the rope. They also asked how wet I wanted to get (one of the benefits of jumping above a river is that you have some flexibility with regards to hitting the surface). Then very quickly I was walked out onto the ledge. It’s just like walking the plank in old pirate films, a short platform over the void. The guy with me was very matter of fact, and I can only describe my feelings as controlled terror. I was terrified, but functional. It took me a really long time to let go of the bridge (as you can see in the video below). Now this is where they get very clever with the mind-control techniques. First of all, the bungee centre is a tourist attraction: coaches arrive regularly and large numbers of tour groups watch the bungee jumps. As I was doing mine there were probably about thirty people watching from the side. What the staff do is make you look over and see just what kind of an audience you have (where he tells me to wave at the other camera, that is where the people are standing). Now on top of the financial commitment you also have a serious pride commitment -there is no way you are going to back out in public. The final thing is that it is all very quick: you look at one camera, wave at another, then have a five, four, three, two, one countdown and jump. This was slightly surreal. I wasn’t sure that I would be able to do it until I actually did it. At first, it felt like time stopped (like those cartoons where the characters hang in the air before looking down and dropping). Then it was just falling through the air. The thing that surprised me is that there is no jerk at all, the whole motion is very smooth as the bands take up the slack and stretch. Once you are bouncing around it is exhilarating. I was collected by two guys in an inflatable boat, as you can see in the video. After my jump, I ran up the steps at the side of the river to see my mate Paul jump after me. We then spent another 30 minutes or so there drinking coffee and enthusing about how amazing the whole experience had been. Doing a bungee jump was a great experience and I am very glad I did it. It is a completely artificial experience, but at the same time one of the few in modern life where you have the chance to do something that feels incredibly dangerous -to face mortal fear and push through it- while at the same time remaining almost completely safe. The stunning location was a huge bonus, and doing it with a close friend just cemented the experience. If you have the chance, I would recommend doing a bungee jump at least once. I may do it again, but I don’t think it would have the same primal effect on me: having done it once, I now know it is safe. Hi Ben. Enjoyed reading your post. I’ve always wanted to try, but apprehensive about the snap-back. I imagined it would be like getting whiplash in a car accident. Now that I have read about your experience, I might give it a shot. By the way, I broke my ankle skydiving for the first time. I also expected there would be a strong snap at the bottom, but there was nothing at all -go for it! How far did you dip in the water? I went bungee jumping over a river here in Yamagata almost ten years ago and my hands went in the river to about halfway between my wrists and elbows. Great fun! You describe it almost perfectly! I said I wanted to get a bit wet, and my hands/forearms went in the water. It was perfect. Man, this article was just exciting. I swear, just by reading it, my hands got sweaty. I’d definitely try this if I get a chance. Just what I needed to hear from other people’s experience before doing mine for the first time next month in Switzerland.